Chris Boswell kicked four field goals and the New York Giants finished off the preseason with a 12-9 victory Thursday over the New England Patriots, who had already won a much larger victory earlier in the day. A federal judge vacated the NFL's four-game suspension of Tom Brady, clearing the Patriots star quarterback for the regular season opener and beyond. The Patriots left the offense in the hands of third-stringer Ryan Lindley, who completed 22 of 45 for 253 yards with one interception and a late fumble. Giants backup quarterback Ryan Nassib played all but the final few minutes for New York and was 16 for 32 for 193 yards and no interceptions. The battle of the reserves ended up being decided by New York's backup kicker, just re-signed the day before. Boswell was waived on Aug. 16 but resigned Wednesday with veteran kicker Josh Brown still nursing a bruised leg from making a tackle. Boswell was perfect with field goals of 34 and 29 yards in the first half and with a 33-yarder late in the third quarter. Boswell's 41-yard kick with 8:18 left to play was the only scoring of the fourth quarter. Stephen Gostkowski kicked three field goals for the Patriots, including a 33-yarder just before halftime to tie it at 6. Gostkowski added a 50-yard field goal early in the fourth quarter to make it 9-9. Brady's whereabouts were unknown Thursday. He didn't play and was not among the players in uniform, but was well represented in the stands. During one early stoppage, The Who's "I'm Free" blared from the PA system as fans wearing Free Brady T-shirts cheered. 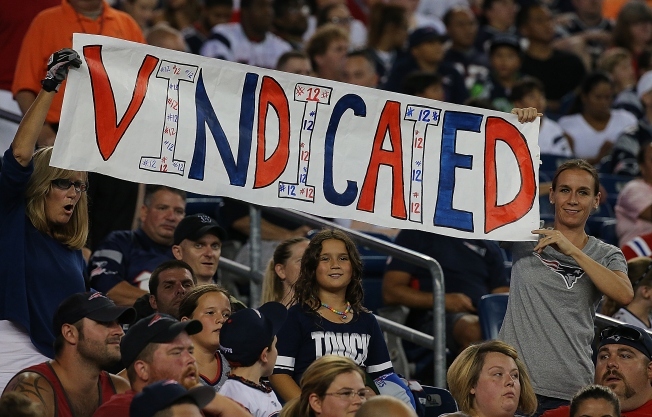 One fan even suggested U.S. District Judge Richard Berman, whose ruling led to New England's collective vindication celebration, should consider higher aspirations. The "Judge Berman for President 2016" sign likely got the most cheers of the many shown on the giant monitors.